Slots rank as the most popular games among casino enthusiasts around the world and UK players are no exception. Online casino operators literally offer hundreds upon hundreds of slot titles which boast diverse themes, fantastic animations, crisp graphics and different special features. This abundance often overwhelms inexperienced players who find it difficult to pick which online slots to try out first. However, prior to choosing a slot title to play, UK players are recommended to first make sure they have registered at a reputable and established online casino that provides secure and fair gaming environment for its patrons. But how can a player tell whether or not a given online casino is legitimate? First and foremost, one needs to make sure their casino of choice operates under a legitimate license. Established web-based casino operators always publish information regarding their licenses at their home page so that players can see which regulatory body has issued the license and what the license number is. 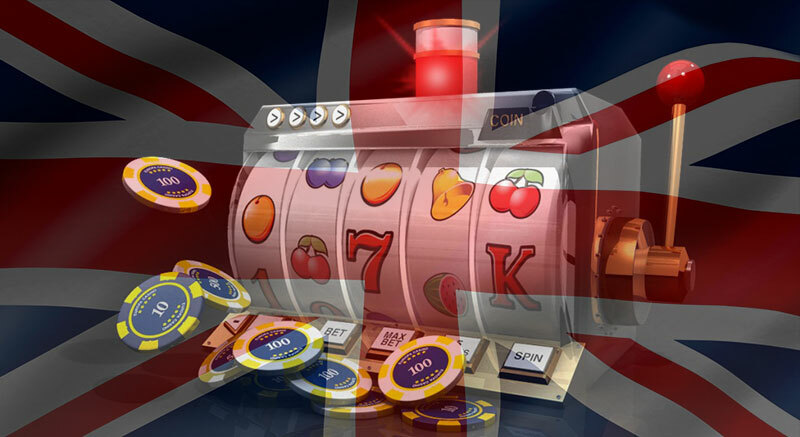 If a given gambling operator bears the stamp of approval of the UK Gambling Commission (required for casinos accepting UK players), the Gibraltar Gambling Commission, the Maltese Gaming Authority or the Alderney Gambling Control Commission, then players can rest assured they are opening an account at a legitimate casino. Then again, players are recommended to check what software providers their preferred casino has partnered with. It is always a good idea to join online casinos, powered by respected and key software suppliers like IGT, Microgaming, Playtech and NetEnt, among others, as this would guarantee a hassle-free, fair gaming session. Checking what payment methods the casino accepts is also desirable – renowned online casinos typically offer a wide range of secure, convenient and time-efficient methods of payment and accept a variety of currencies to meet the needs of their player-base. Adequate customer support is another sign you are registering at a reputable online casino. Web-based gambling operators that provide timely and courteous customer support via their live chat facilities obviously respect and care for their customers. Once you have ensured your online casino of choice welcomes players from the UK and covers the above-mentioned criteria for reliability, you can proceed to open your account, make a deposit and choose a popular online slot to bet on. To help less experienced players from the UK to make their choice, we have compiled a list of the top five online slots that have proven themselves to be the most popular titles on the UK online gambling market. 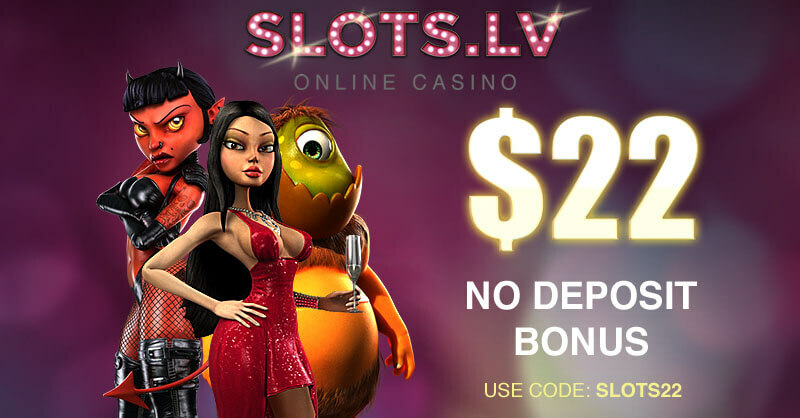 The online slots we have reviewed below can be found at some of the most reputable web-based casinos that welcome players from the United Kingdom like Hippodrome and Eurogrand, for instance. 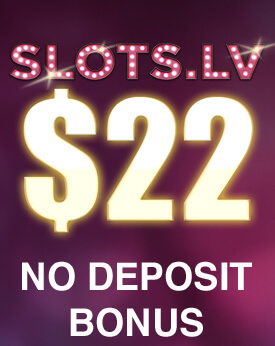 The slots are available in Fun mode, so players should feel free to test them and see which ones correspond to their individual preferences prior to committing with real-money wagers. 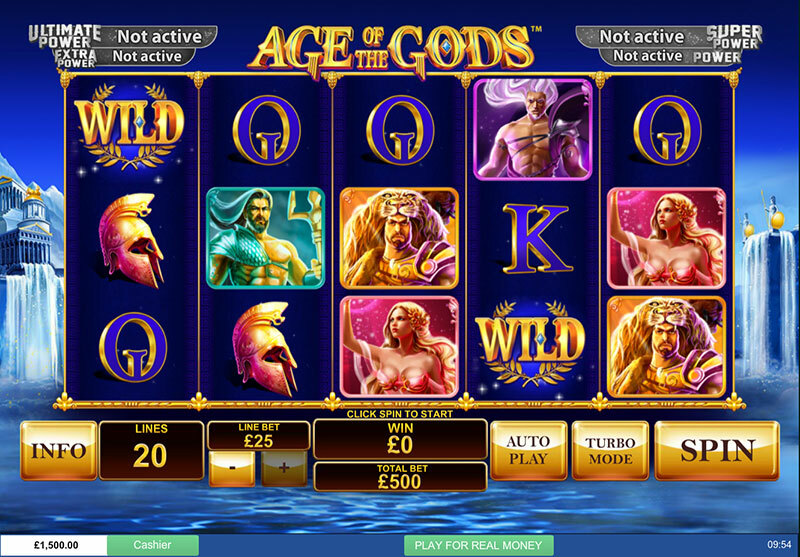 Key software provider Playtech was inspired by Ancient Greece’s mythology for their Age of Gods slot which enjoys a great popularity among UK players thanks to its vibrant, colourful graphics, compelling sounds and fantastic features. 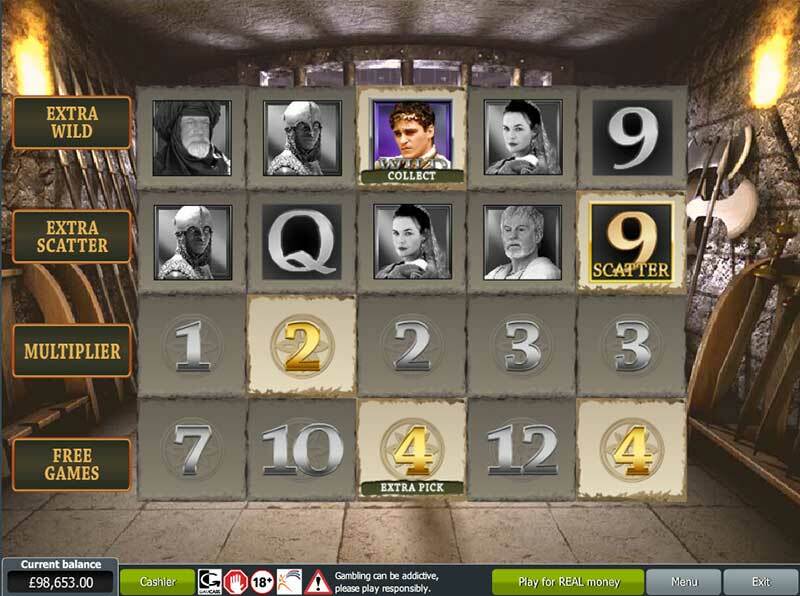 The Age of Gods slot is played on five reels and allows for bets to be made on 20 fixed paylines so players cannot select how many of them to activate. There is the option to adjust the coin values that range between £0.01 and £25.00, which provides slot fans with the opportunity to wager between £0.20 and £500.00 per spin. The Age of Gods slot carries a massive winning potential as the maximum amount players can scoop is 10,000x the amount of their wager per payline. This huge prize is granted to those who succeed in landing five wild symbols on the reels. Another lucrative symbol to look for is the scatter, represented by the Age of the Gods logo. Three or more of those symbols will trigger the Age of the Gods bonus game. 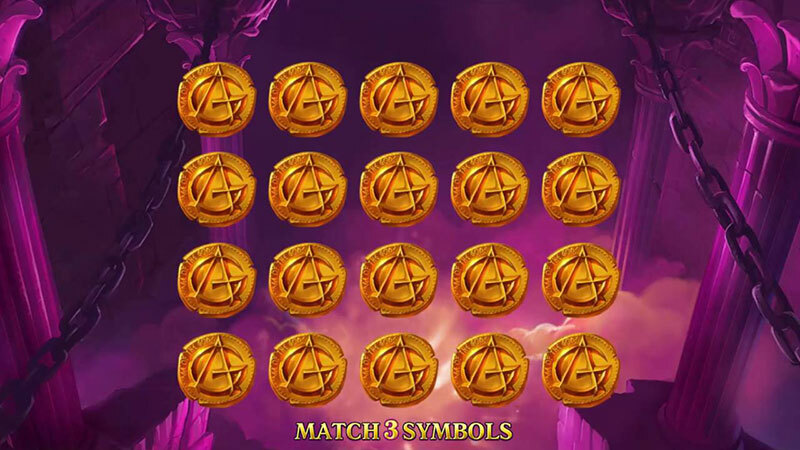 Players will be then taken to a separate screen where they should pick three out of twenty coins in order to match up three identical god characters. Each deity in the game unlocks a round of 9 free spins with different characteristics and multipliers. What further increases the popularity of this slot is the progressive jackpot that is attached to the game. Similarly to the slots from Playtech’s Marvel series, Age of the Gods is linked to four different progressive jackpots, namely the Power, Super Power, Extra Power and Ultimate Power. It is the Ultimate Power jackpot that awards the highest prize which may reach a seven-figure sum. What is more, several other titles inspired by Greek deities (like King of Olympus, Prince of Olympus, Athena: Goddess of Wisdom, and Furious 4) contribute to the pool, which allows the progressive prize to accumulate at a very rapid pace. 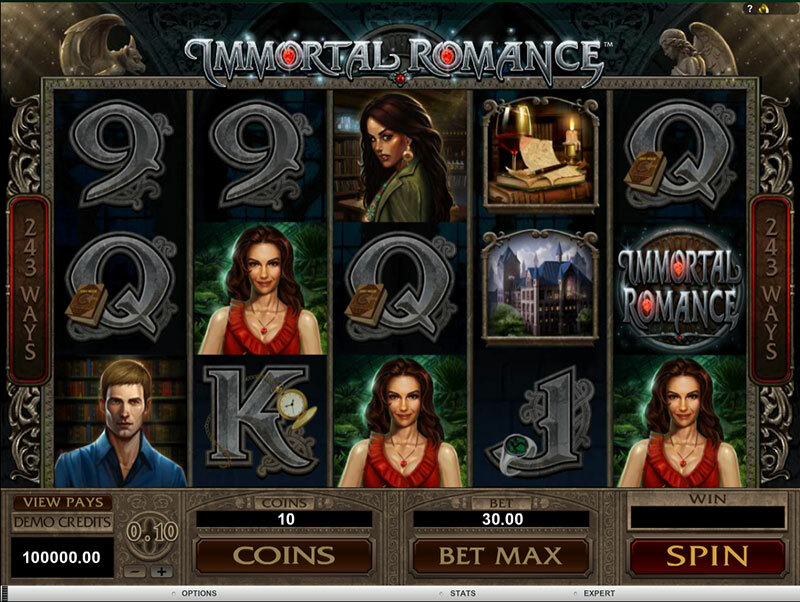 Immortal Romance is a five-reel slot in the popular 243-ways-to-win format and is courtesy of well-known software developer Microgaming. The slot stands out with a vampire-based theme and boasts a thrilling Gothic atmosphere that will keep fans of vampire stories on the edge of their seats for hours on end. Some of the key features of the Immortal Romance slot include Paytable Achievements, the Chamber of Spins and the Wild Desire bonus feature. The Paytable Achievements functionality is unique to Microgaming slot titles and enables players to collect additional prizes and bonuses whenever they achieve a specific game objective, like completing the payouts for each individual symbol, for instance. Players are granted an entry to the Chamber of Spins whenever they line up three or more scatter symbols (the golden lion door-knockers) on the reels. The Chamber comprises of four different levels and each one awards players with a different number of free spins with multipliers on wins. Players are expected to trigger this feature a certain number of times in order to progress through the four levels. 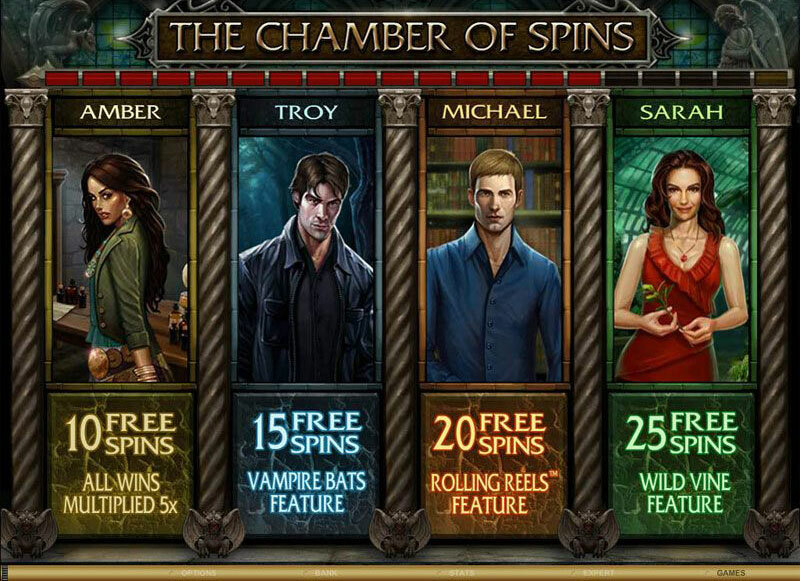 Another lucrative feature is the Wild Desire feature which is unlocked at random to turn up to five reels wild. Interestingly enough, apart from winning combinations and their payouts, the paytable of the game features each of the four main characters’ story which further contributes to the complexity of the slot’s storyline. If you are a fan of the now-iconic Gladiator film, which earned actor Russell Crowe an Academy award, you will surely enjoy placing a few bets on its slot equivalent. 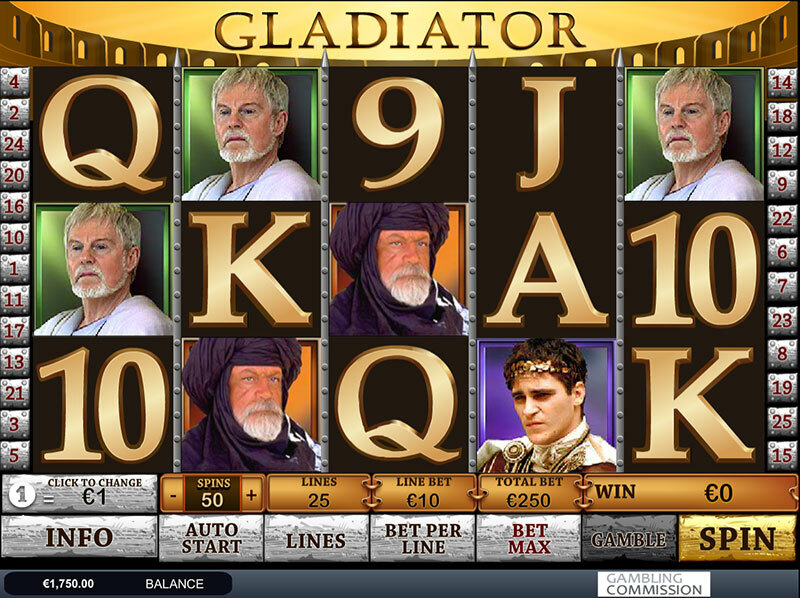 The Gladiator slot was developed by software supplier Playtech and features five reels with 25 paylines. The game is suitable for all players, regardless of the size of their bankrolls, as the paylines are not fixed, so slot fans can pick the ones they wish to bet on. Many of the film’s characters are featured as symbols on the reels, including General Maximus, Emperor Commodus, and his sister Lucilla. The Coliseum symbols are scatters so when players land three of those on the reels, they will unlock the Coliseum Bonus feature, which can earn them free spins with different multiplier values. The Gamble feature is also of some interest as it enables players to double their profits. The feature gets activated whenever a winning combination lines up on the reels. A mini game will appear on the screen where players are expected to pick between black and red and then flip over the card in the middle to see whether they have chosen the right colour. If the guess is correct, the player’s winnings are doubled, but if it is wrong, the winnings are removed from their balance. The helmet symbol, on the other hand, functions as a wild but more importantly, if you line up three helmets on the second, third and fourth reels simultaneously, you will unlock the Gladiator Jackpot Bonus game which is the greatest attraction this Playtech slot has to offer. A “pick me”-based game will start where players are required to pick nine helmets. Those, who succeed in selecting nine gold helmets will be awarded the massive progressive jackpot. 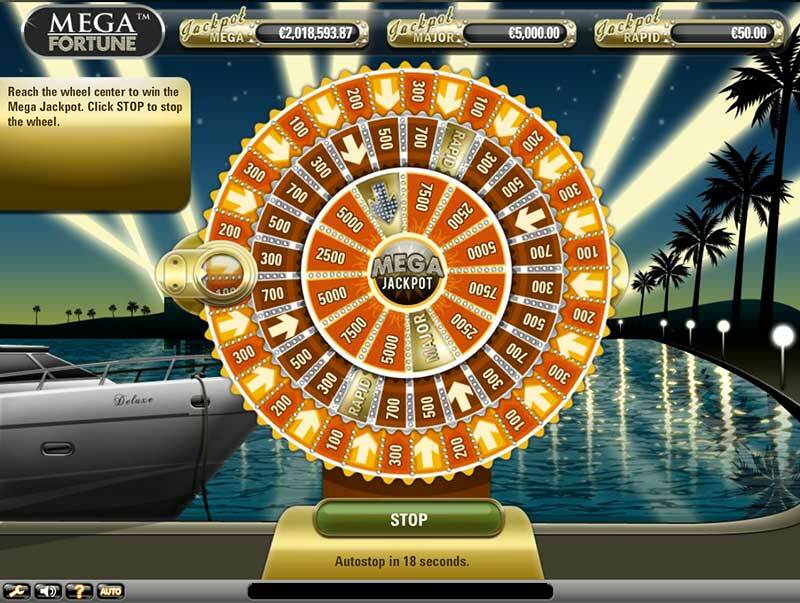 Courtesy of established software provider NetEnt, Mega Fortune ranks high in terms of popularity among British players because it carries a massive winning potential and provides them with the chance to win one of the three progressive prizes it is linked to – the Rapid, Major and Mega Jackpots. 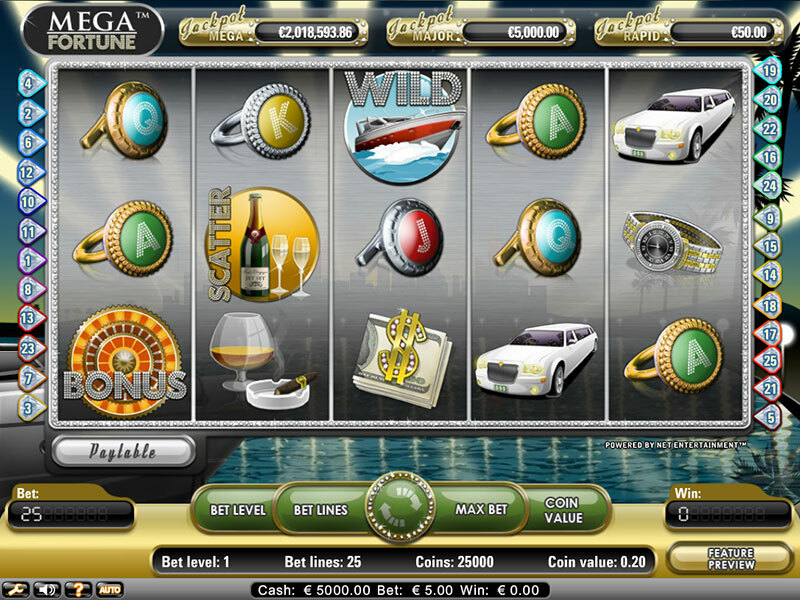 This five-reel slot features a total of 25 paylines, which can be adjusted and is inspired by the lifestyle of the wealthy. Some of the symbols the game employs include yachts, jewelled wristwatches, limousines, and cigars. The lower paying symbols are represented by various high cards. Some of the most important symbols to look for include the yacht, a bottle of champaign and a wheel. The champaign bottle plays the role of a scatter symbol and can activate rounds of free spins with multipliers of up to 5x. The yacht is a wild symbol and if you land five on those on the reels, you will be rewarded with a prize of 10,000 coins. Three or more bonus wheel symbols from left to right will activate the bonus game where players are expected to spin a wheel with two inner circles to earn guaranteed cash prizes. Those, who get to the innermost circle can potentially win the slot’s Mega Jackpot which often reaches a seven-feature sum of money. 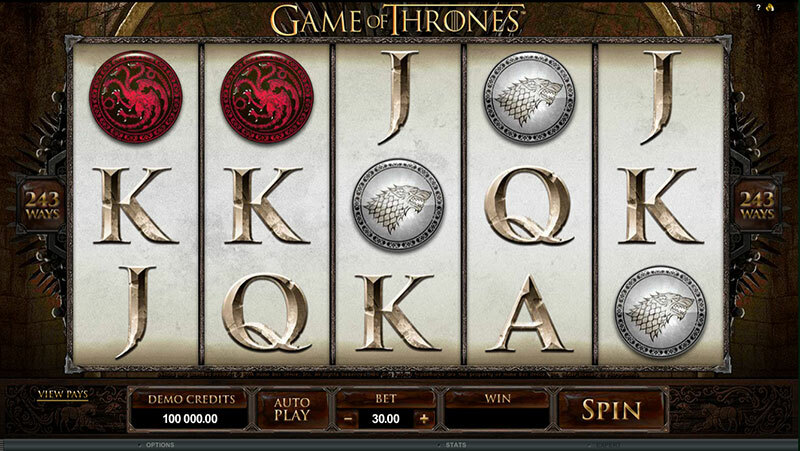 The Game of Thrones slot resulted from the joint efforts of software developer Microgaming and HBO. The game features five reels and is available in the popular 243-ways-to-win format, although another variant with 15 paylines only is also offered by some online casinos. The slot employs various symbols that depict the different Westeros Houses, including the deer, the lion, the dire wolf and the three-headed dragon. The game is packed with great features which were designed to increase players’ profitability and keep them entertained for a long time. For example, those who manage to land three or more Iron Throne symbols will unlock four different rounds of free spins based on the houses of Baratheon, Stark, Targaryen and Lannister. The maximum number of free spins players can receive in the game is set at 18, with multipliers of up to 5x. 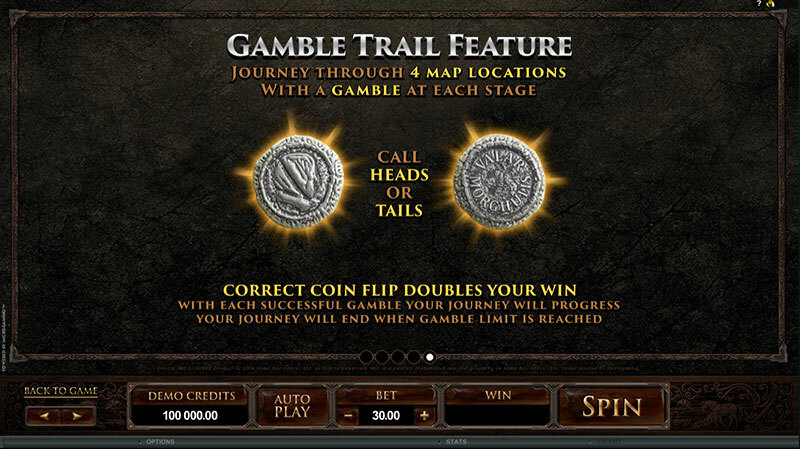 There is also the option to activate the Gamble Trail feature whenever you land a winning combination. This Trail includes four stops – the dire wolf, the dragon, the white walker and the three-eyed raven. Players start with the three-eyed raven and are required to play a game of heads or tails. If they guess correctly, the winnings will be doubled, allowing them to proceed to the white walker stage for another heads or tails game and so on. Each correct guess is accompanied by great animations and short clips from the popular TV series. This way, one can increase their winnings up to four times, but of course, there is always the option to collect what you have already won at any stage of this mini game. The Game of Thrones logo is the wild symbol in this slot. It can substitute for missing symbols to help players complete their winning combinations, but more importantly, it can be stacked to cover the entire reel which further boosts one’s chances of winning.